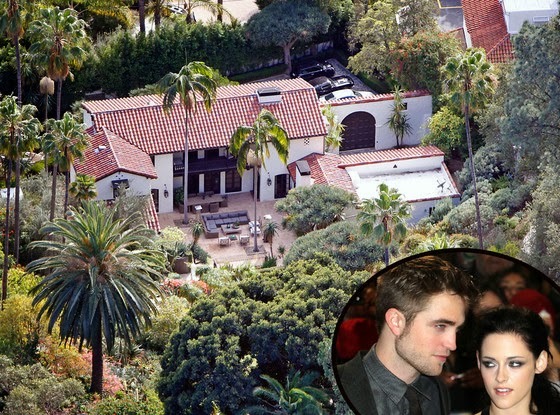 Robert Pattinson and Kristen Stewart's former love nest might not be empty for long. According to RealEstalker, the actor is looking to sell the $6.2 million mansion in Los Angeles he once shared with his Twilight costar. The Dior spokesmodel first purchased the three bedroom three and a half bath house in 2011, about a year before his then-girlfriend's cheating scandal in July of last year. When the couple split, the actress scored a $2.2 million pad right down the street from the Spanish-style mansion. A few months later during their temporarily reconciliation, the pair began to spend time together in both homes in the Los Feliz neighborhood. Alas, the duo's final breakup this summer seems to be sticking. Pattinson has been renting a five bedroom and six bathroom home in Beverly Hills, which includes a sports bar, heated swimming pool, steam room, library and spa. The actor recently spoke about fixing up his new pad. Telling Harper's Bazaar Arabia that he's been "fixing pipes."